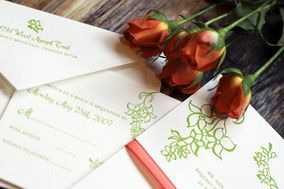 Tickled Ink is a design and invitation studio located in Atlanta, Georgia, but also accepts orders online from clients everywhere! We bring your occasions to life on paper. Whether you are having a baby, getting married, moving, throwing a party, or just want some personalized stationery, Tickled Ink can customize your vision. If you are in the Atlanta area, please set up a free design consultation to meet at the Paisley Umbrella, a boutique in the heart of Buckhead. Take a look at our signature collection, and if you want us to create something special to look and feel like you, contact us for a custom design quote! We also offer letterpress, thermography, engraving, and flat printing for every budget! Tickle your paper!